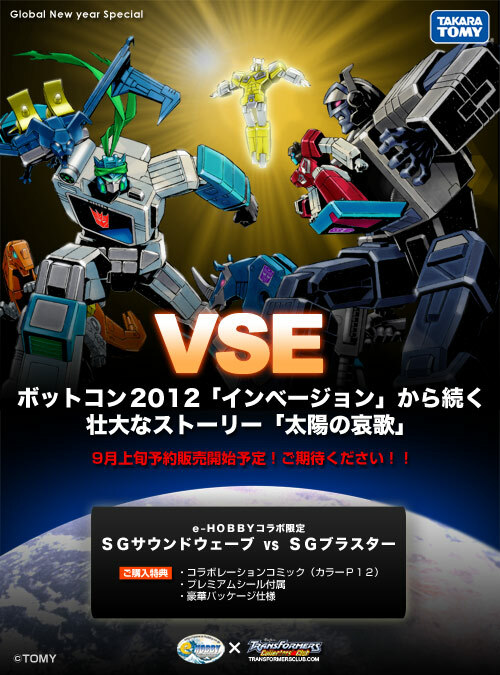 Yes, that’s right – eHobby is doing a SG Soundwave vs SG Blaster set. A.W.E.S.O.M.E.!!!!! All recolored in their Shattered Glass persona. I’m telling you right now, I’m all in on this one. All….In. And it actually provides a nice transfer to my next post, so stay tuned! (on a side note – Ratbat’s SG design is based on Dave Willis’ (aka Walky) “Recordicons Bat Bot” design. He’s actually a Batman like character how META! You can take or leave Walky, but the dude directly influenced a Transformer Toy which is pretty awesome). This actually makes a lot of sense with the recent Soundblaster/Twincast Encore releases. Although people are saying that is Dial and not Slugfest, interesting. And I hear that they wont’ be able to use the molds after a couple of years so they might as well get it in now! I thought it was Dial at first too, that would be awesome but it doesn’t make sense seems Dial is an Autobot, he wouldn’t be fighting WITH Soundwave. Also, he’s the color of SG Slugfest. I don’t care, I’ll love either one to be honest! I’m still not a fan of the SG stuff, but I find this set very interesting…esp. if the packaging is like the G1 VS stuff. I can understand that, it seems like there’s a 50/50 split on people who either like or dislike the SG stuff. I like it a lot. But yeah, this might end up being a set that EVERYONE will be interested in for sure! I’m not a fan of SG either, but those look nice! Definitely a pickup for me. And which molds will they not be able to use anymore? Is it because of overuse? Yeah, it seems like the fandom is 50/50 on SG. I honestly can’t say why I like it so much, I just do. I guess I’m a sucker for fun re-paints. It’s not 100% accurate, but I read that the Soundwave and Blaster molds are going to be retired, possibly more of the G1 molds as well, like Prime, but I’m not posititve so don’t hold me to it yet. I’d like to see some of the old molds retired just for preservation. That and I’m a little tired of the same old reissues. Surely Takara has more intact molds than the same ones they’ve been reissuing. I agree 100%. Lets see some reissue Pretenders or Headmasters or something!